Condesa escorts him away in a hover buggy she summons electronically while Clark readies himself for round two with Sand Superman. Clark takes the fight down to the street and puts Sand Superman in a headlock. He theorizes that if his twin shares his addiction to solar flaring and he can force him to flare he will regain his powers. It doesn't work in the way expected, instead of making Clark, Superman again it superheats Sand Superman into glass. Clark returns to the hideout to find Condesa has turned all the electronics against Yurei, trapping her in a metallic prison. Yurei realizing her part in the plot is over, reveals that despite his victory, Clark won't be safe as Hordr_Root will hunt him down with or without her. Clark then visits Jimmy, who thankfully is on the road to recovery. Despite Condesa reassuring him, he can't seem to shirk the blame that this was all because of him and makes his way to the Mythbrawl arena. Shahrazad catches Clark clearing his locker and realizes he is going to have a fight to the finish with Hordr. She asks him to hold his battle in the Mythbrawl instead of the match with Haemosu. Clark points out he isn't as strong as he once was, Shahrazad points out his strength is what people see but it isn't who he is. 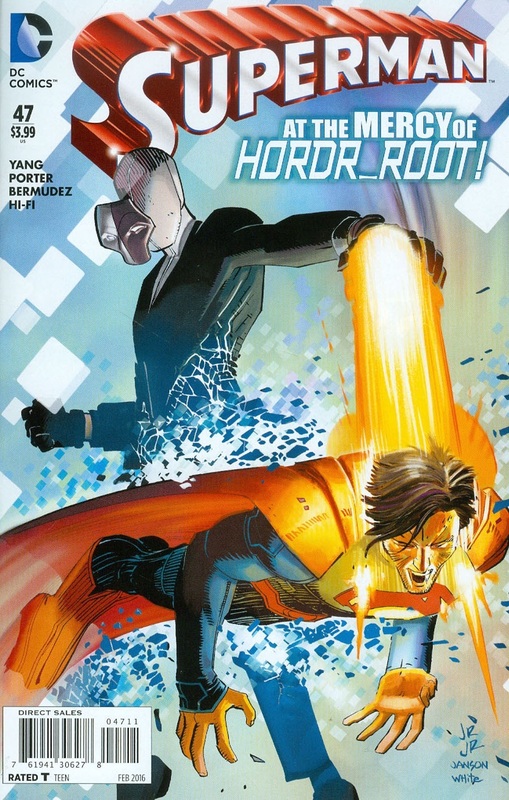 Later Clark and Haemosu put on the scheduled brawl but this time Hordr_Root, robots and Quarmers crash into the Thousand One House, however, unlike their past encounters, this time it is a fake out and Clark has set a trap. Mayari creates a bubble around the arena that traps them all inside and blocks all communication and signals. Hordr is trapped this time and cannot transfer his mind to another node. Avenging Apolaki, the gods fight toe to toe with Hordr's robots until Clark can grab Hordr and finally end the story with a broken neck. Clark drops Hordr and the villain laughs that now none of his friends and family will be safe. Enter Condesa with a portable hard drive, who promptly downloads the villain into it like a ghostbuster's trap. Clark recognizes the node's real voice and unmasking the node he finds Jimmy. He realizes he was a hair's breadth from killing his best friend and cradles him as he falls unconscious. Clark takes the hard drive to Mr. Terrific and asks him to keep it safe away from any RF signals that could enable Hordr to escape and returns to Shahrazad for a final storytelling to heal his injuries. Shahrazad reveals his story has changed, it isn't his strength people see anymore but the choices he makes everyday. Clark says his goodbyes to the Thousand One House and his newfound friends, deciding to return to Metropolis with Jimmy and Condesa. Jimmy, while sleeping, sees into Hordr's past. He was once a super intelligent hacker who just happened to be handicapped. When he discovered his lineage he confronted his father, Vandal Savage, and was spurned for his disabilities. With only his friend Yurei at his side he managed to create a node for himself to transfer into from a cadaver. The cadaver killed the original body and so on until years later he was able to become Hordr, the ultimate hacker of knowledge and a worthy son to Vandal Savage. Jimmy awakens and reveals that he is now the only living node of Hordr, he has all of his memories and that's one reason why Hordr was always able to escape. When nodes were 'deleted' his secrets were erased with them and Clark finally has an edge on his enemies. This edge doesn't last as Vandal Savage attacks Mr. Terrific's office to retrieve Condesa's hard drive. Story - 3: After all the twists, all the turns, I can honestly say this was Superman's version of the Star Wars prequels. Should I be angrier that Jimmy's death was a misdirection? No, comics do that final panel thing all the time to get you hooked in to buying the next issue. Aside from his fever dream at the end, Jimmy Olsen single handedly proved this storyline was a waste of time and that is what has made me angry. In fact, now that this is almost at an end, it has actually lessened the impact of the other books. 'Infiltration' and 'Mythbrawl' added nothing at all to the story that was already happening. We waited nine months to discover that, like Wrath and Alexander Bend, Hordr_Root was secretly an (as yet unnamed) son of Vandal Savage - which Peter J. Tomasi revealed in much better fashion in Superman/Wonder Woman #23 on one page, rather than issue after issue of angst padded story-lining. After all the bravado of Hordr being an unbeatable foe with ties across the planet to the information superhighway and no secret being safe, this end to him, the man that killed off Clark Kent, is a rather lackluster one. 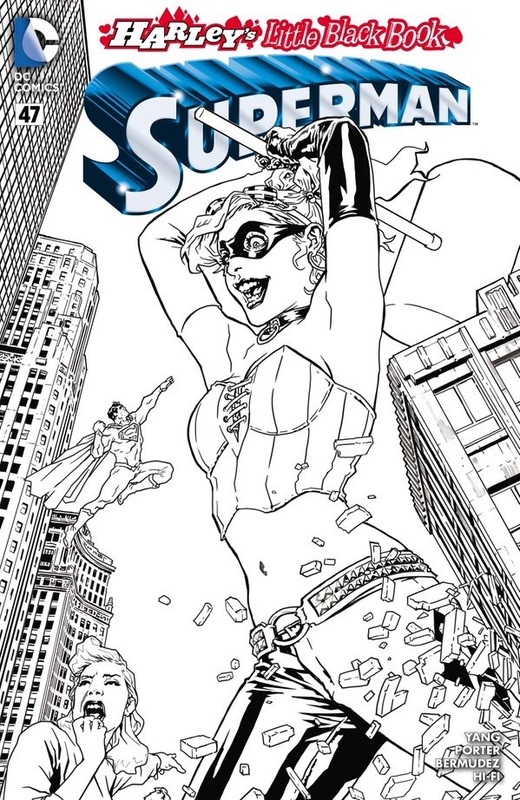 The loose threads are tied but, as the other chapters of 'Truth' have been soldiering on while we have been waiting to join them, all I got was Superman wallowing, sadly 'Grounded' did this same storyline and actually they did it better. I just want this title to get up to date fully with the other books. Art - 4: Aside from the jarring changes in the final two sequences, the art is fantastic. Having fluidity and a frenetic energy the art seems to leap from the page with a likability and familiarity, the kind that Lee Weeks evokes over in Lois & Clark. The art for the dream and finale seems to fit as self contained pieces and I admire and enjoyed their pages but didn't feel as a whole they worked together. Cover Art - 2: Anatomy be damned. If this was a work of symbolism for the overall story arc it works to an extent but in time placement, in storyline placement and in an art class it otherwise does not. 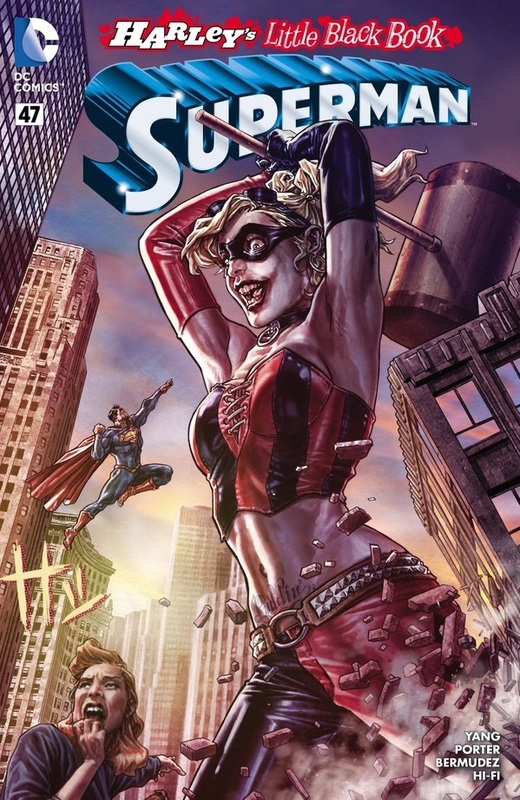 Harley Quinn Variant Cover Art - 4: Beautifully rendered but a bizarre variant. I would love to read the story that inspired it though. 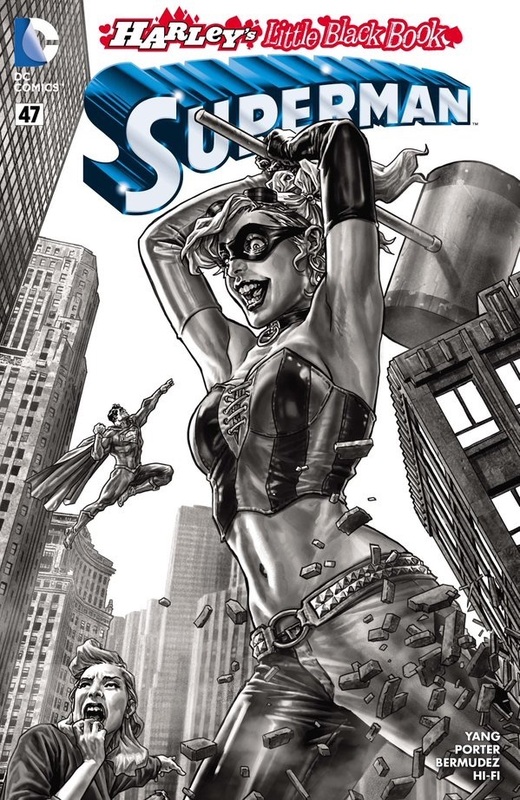 I think I would have liked Superman to be more prominent than Harley!